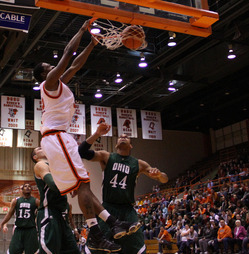 Bowling Green fans love Torian Oglesby's highwire act. 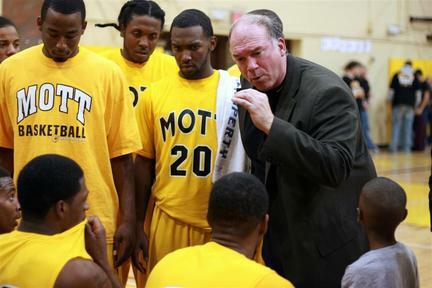 Check out this story from Bowling Green about former Mott forward and Saginaw BV product Torian Oglesby. The junior is starting to become a fan favorite with his displays of athleticism, but also a coach’s favorite with his new-found productivity. It’s a moment of perfect synergy. Jordon Crawford, running the offense from the point, sends a lob pass toward the basket; his target, Torian Oglesby, has already started his approach. In a matter of seconds, it’s resulted in another crowd-pleasing alley-oop dunk, bringing the Anderson Arena crowd to its feet. Considered non-factors at the beginning of the season, Oglesby and Crawford have become key cogs in the BG offense, combining for 15.6 points per game in Mid-American Conference play and connecting for alley-oops on an almost once-a-game basis.